You know your town is on the beer map when a brewery in Missoula, Montana is willing to ship their beers here! Big Sky is the latest new brewery to distribute beers in our state. 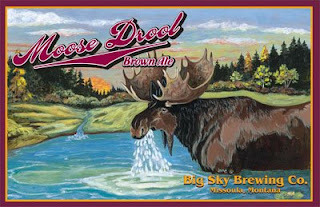 They are best known for their Moose Drool brown ale (5.3%), a solid, easy-drinking beer. I first had this beer in Minneapolis at a bar in the Mall of America. The place had the worst service, but that's what you get for going to a bar in a mall. The other Big Sky beers available are Scape Goat Pale Ale (4.7%), Trout Slayer Kristalweizen (filtered wheat beer, 4.7%), and IPA (6.2%). Haven't tried the Scape Goat or Trout Slayer but the IPA has a good hop punch that should be popular here. Jubilation has these beers for $7.99 a six-pack. 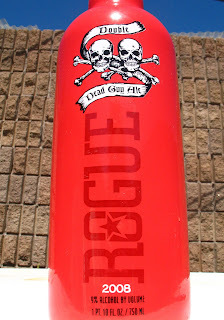 I've been waiting for this beer for a long time, and I saved up enough money, and it's finally here- Rogue's Double Dead Guy (9%). This beer should probably be classified as an American Strong Ale, but I have read about it being called a doppelbock which, strictly speaking, it can't be because bocks are made with lager yeast and this is an ale. People have been calling the regular Dead Guy Ale a Maibock for years, which also can't be true, but call it what you want. Jubilation has it for $11.99 per 22 oz. bottle. Thank you Rogue for not putting this in a ceramic bottle and therefore saving the consumer four dollars off the sticker cost. Younger's Imperial Special Bitter (7.1%) is a ceramic series beer, and is also on the shelves, this one spotted at Kelly's Liquors for $15.99. This strong ESB is named after Don Younger, owner of the Horse Brass Pub in Portland, OR. I didn't go there when I was in Portland because The name Horse Brass Pub made me think of a British or Irish style pub that has Bass, Guinness, Smithwick's, Harp, and Newcastle for their beer selection. Check out the beer list on their website for another example of how wrong I can be. I have yet to drink the Double you picked up for me, I was hoping for an invite over so we could drink this one with the Wii, seeing as how your foot is fucked and what not.